There are several different types of pimples, from blackheads to pustules, all of which are unique and equally unwanted. The trick to dealing with your acne is to pinpoint the type of breakout you have and get informed about how to treat it effectively. A blackhead is a mass of dead skin cells and oil trapped within the pore lining. When the tip of the oil plug makes its way to the surface, it oxidizes and forms a black dot. These are most commonly found in the T-zone areas (forehead, nose and chin), as well as on the back and shoulders. Pore strips and/or harsh scrubs are minimally effective in this case, as they treat the surface only. Instead, we recommend using a gentle BHA exfoliating cleanser. We recommend visiting a skincare professional for the treatment of blackheads. The tools and techniques needed to successfully extract them without causing damage to surrounding tissue are highly specialized. If you are the do-it-yourself type, we suggest exercising extreme caution when following the steps below. Blackheads can be removed by placing a warm washcloth over the area for two minutes. Then use a comedone extractor, a small inexpensive tool found at most drugstores. Center the extractor over the blackhead and gently press and pull downward at the same time. If nothing happens, wrap a tissue around two fingers, and apply a little bit of pressure around the outside edges. If the blackhead still resists extraction, the blackhead is not yet ready to be removed, and forcing it could cause tissue damage and scarring. *Please see a licensed skincare professional to ensure safe removal of blackheads. Whiteheads, otherwise known as Milia, are an accumulation of dead cells and oil trapped beneath the skin. These resemble a small grain of sand stuck just below the surface of the skin. Whiteheads can appear on all areas of the face, back and chest. 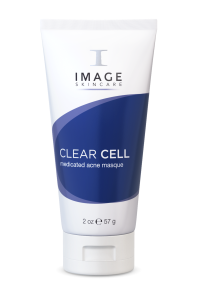 To treat whiteheads, try using our Clear Cell medicated acne masque once per week. This product’s blend of salicylic and glycolic acid exfoliates the surface of the skin, helping to draw out excess oil and dead cells. *It is recommend that you see an esthetician or dermatologist for manual removal. Papules are red bumps with a white surface filled with fluid. These occur when a clogged pore ruptures and bacteria causes the area to become inflamed and tender to the touch. When a papule becomes large and swollen, it has become a pustule. Both papules and pustules commonly appear around the cheekbones and jawline. Teenagers dealing with chronic acne commonly suffer from a combination of papules and pustules. In this case, we suggest our Clear Cell line, which uses salicylic acid and a revolutionary peptide complex, both proven to help battle aggressive acne. Cysts and nodules are large, painful bumps that go deep into the sebaceous gland. For cysts or nodules, please visit a dermatologist for treatment. Maintaining a good skincare routine, with a gentle yet powerful exfoliant is your best defense against all forms of acne.